Danielle: This season, Marni took their geometric aesthetic to an aquatic level. The collection was obviously inspired by wetsuits, swimwear, and large duck feet. The mix of ‘70s inspired textiles made my heartbeat rise, but I would never wear a shoe that made my foot look that wide. Or flat. Harry: Marni stands for all the things I like: rich colors, art, eclectic bohemian, ’60s prints, demurity and quirkiness. This season, Marni girls are ready to be involved in sports. All models walked with leather caps and sandals. My favorite looks were all the laser-cut leather pieces. Since the theme is beach/sports, the poor models had to strut in sandals—which made them looked even quirkier. The orange lips were definitely something that I’ve loved for a while now. It’s just so fresh. If I were a rich Italian twenty-something woman, I would only wear Marni everyday — and the orange lips too. Danielle: Missoni shocked me this season by producing a bold, youthful, very “Danielle” collection. Inspiration was drawn from epic textile centers of the world including Africa, Mexico, and South Eastern Asia. If you know me at all, you can only assume how quickly I fell in love with this collection. Honestly, I would wear almost every piece of it. I am especially loving the large square hats, typographic letters in the knits, and trend focused sunglasses. Harry: Like Marni, Missoni is one of the other fashion houses that apply the principles of design that I like. Missoni girls are going on a trip. Judging from the prints, I would say it’s somewhere Africa or Indonesia. Angela Missoni found a new method of knitting the famous Missoni classics and making them able to hold pleats and light enough to be transparent. The youthful vibe is more noticeable, perhaps because Angela’s daughter Margherita has folded into the family biz. Danielle: Here we go –- another bold, vivid Spring collection in hues of green, orange, and blue. 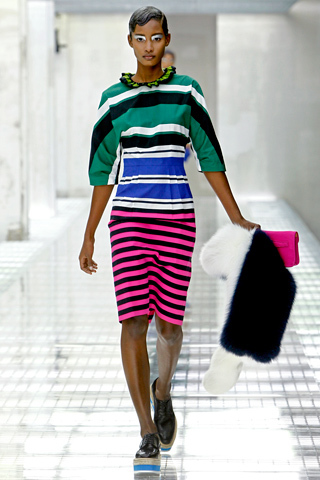 Miuccia’s direction informs us to wear monochromatic bold colors, or a mixture of bright textiles. I wonder, who is actually going to wear these almost neon monochromatic looks? I think there’s always room for funky, swirly, humorous fashion each season, and Prada’s banana textiles prove that this is it. But, that first wedge? It needs to go. I feel like it’s the elevated sneaker I lusted over in middle school. Instead, let’s throw on a neon orange heel. Harry: Miuccia Prada has such a high taste level that she can send hospital scrubs or “trash” handbags down the runway and made editors like them. For some reason Miuccia still thinks hospital scrubs are oh-so-fashionable and decided to send them down the runway again for her women’s collection. Apart from the hospital, the ’20s played a big role in inspiring Miuccia. Some of these elements are apparent in finger waves, flapper dresses, and that Josephine Baker vibe. I am a huge fan of stripes and Miuccia showed some of the best combination of stripes. It’s that high taste level, guys. Danielle: Moschino’s scattered collection mashed up polka dots, ruffles, floral appliqué, stripes, gingham, and accessories on every limb. There was unity in the collection’s color scheme and an over all feeling of playfulness when compared to their previous fall season. But, the contrast of patterns in some of the looks feels more like a super-clash than a nice mix and match (take a gander at look eight — it’s almost blinding.) Maybe the runway lights make the looks harder to view — but maybe seeing the pieces on the street would be easier on the eyes. 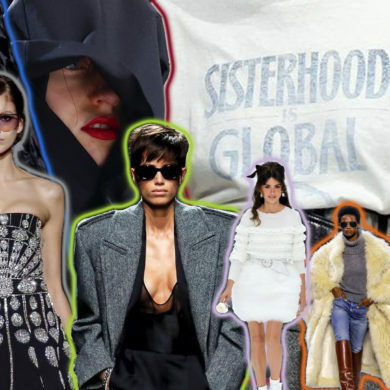 Danielle: It is arguable that the most exciting part of Fendi’s collection was the backstage photos of models Abbey Lee and Jac in beautiful punchy pink and coral lip colors. 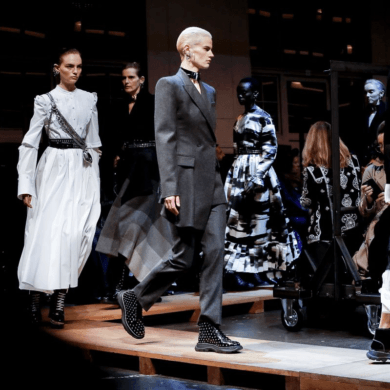 On the runway, Karl’s minimalist designs left me bored, and with a loss of passion to view the second half of the collection. 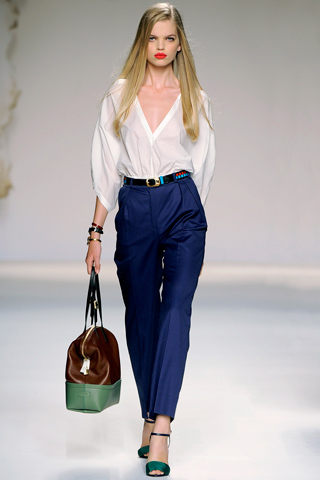 The majority of looks had a baggy silhouette that was shaped by a thin waist belt or two. This looks great on thin models, but I’m skeptical about how it would hang on the average woman’s shape. Harry: Fendi haven’t really produced any editorial-worthy or memorable pieces in past. The most memorable thing about Fendi was probably the Spy Bag. The Spring 2011 collection was quite similar with the rest of Fendi clothes. The silhouette and proportion were like ’70s sportswear. Fendi’s Spring 2011 collection was not bad — it was plain. It was just pretty clothes for thin women—nothing memorable at all.